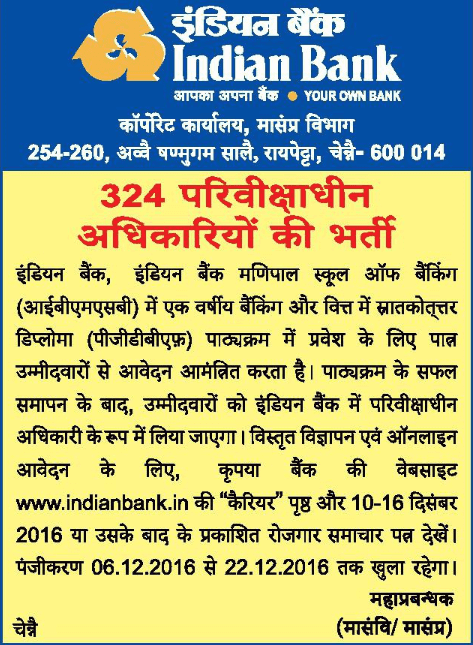 Indian Bank is going to recruit for the post of Probationary Officer.The candidates may apply till 22nd December 2016. It is the company of Financial Services which is Indian state-owned. It has 2100 Branches all over the India. The headquarter of the company states in Chennai. Indian Bank gives the many facilities like Personal Banking, Corporate Banking, Mobile Banking, Phone Banking etc. Candidates should have completed their bachelor degree or equivalent qualification as per given in the Indian Bank PO official notification. Age Limit:Candidates must be an age of 30 years and it will be considered as on the last date of online apply. Minimum age should be 21 years old. The candidates need to pay the application fee as per given in the official notification by the Indian Bank. The candidates need to apply online through official website. They need to fill the application form with required details.